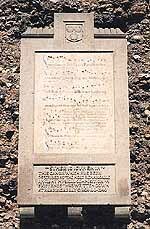 On the wall of the Chapter House is a memorial plaque showing an ancient page of music. It reminds us that one of the earliest recorded pieces of music from England was written down here at Reading Abbey, probably in the Cloister. "Sumer is icumen in" (Summer is a-coming in) is a four-part rotational harmony dating from around 1225. It is well known across the World and often remembered because of its repetitive 'Cuckoo' chorus. The original manuscript is now in the British Library.